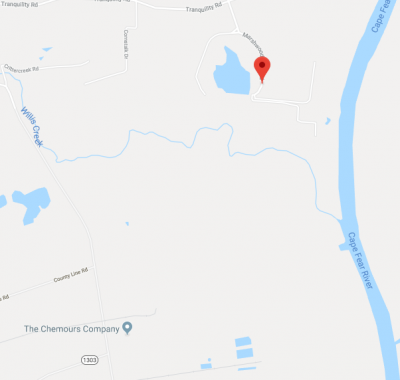 DuPont had yet to break ground on its chemical plant when Elsie Dew’s father dug Marshwood Lake in 1964, in a hushed forest off Tranquility Road near the Cumberland-Bladen County line. The Dew family used to be the only folks out here. But now Marshwood Lake is stocked with fish, has its own road, and is ringed by modern homes tucked in the woods with a waterfront view. A half-mile southwest and downstream, DuPont built its factory in 1968 along the bank of the Cape Fear River. The 2,100-acre chemical complex, which includes Chemours, a spinoff company designed to shield DuPont from further legal action, has been a neighbor of Marshwood Lake for nearly 50 years. Now the drinking water wells of Dew family, including their son, daughter-in-law and grandchild, have tested from 530 to 730 parts per trillion for GenX. That level is three to four times the state’s provisional health goal of 140 ppt. Water samples taken from Marshwood Lake tested at 915 ppt. 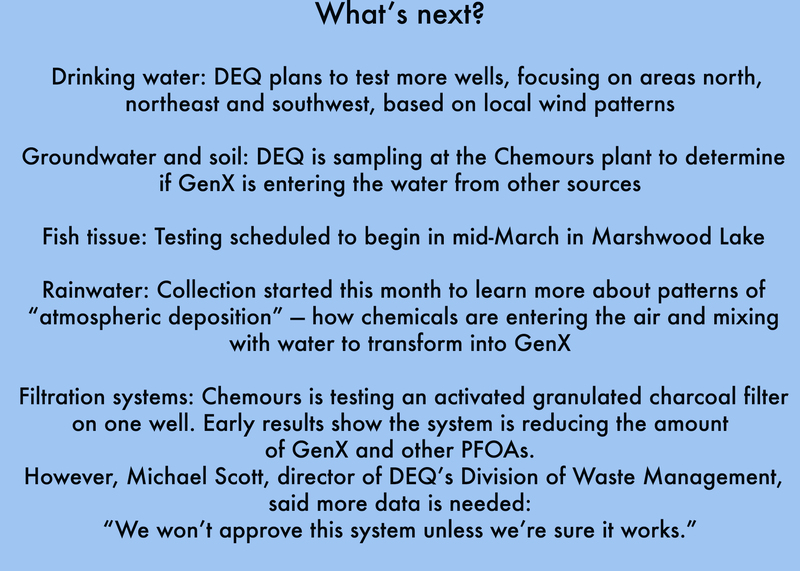 Since September, the Dews have depended on bottled water, provided by Chemours, for drinking, brushing their teeth, cooking and preparing food. have tested well above 140 parts per trillion for GenX — the state’s provisional health goal. The information session was the fourth sponsored by the state’s environmental quality and health departments. 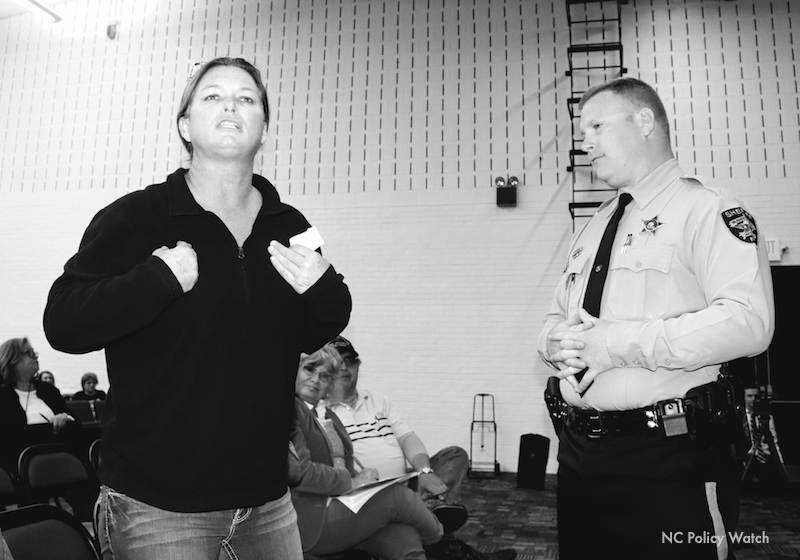 And with each session, the list of questions grows longer and the tempers of the residents grow shorter. Not only are the extent and effects of the chemical contamination unknown — there are no human health studies on GenX — but data collection and analysis is a protracted process. It requires state samples to be shipped to the EPA and state scientists to verify Chemours’ own testing protocols. And with each test result, state environmental officials are learning that GenX and other emerging compounds have been released into the air, surface water and groundwater. Even though state inspectors have confirmed Chemours is no longer discharging wastewater from the plant — the pipes have been severed and capped — there continue to be spikes of contamination at the Chemour outfall, at 2,300 ppt in mid-December. “We have not found the edge of the contamination,” said Michael Scott, director of the Division of Waste Management, which oversees groundwater. Consequently, the state has begun Phase 4 of sampling farther and farther from the plant. They are following the local wind patterns, to the southwest, north and northeast for new rounds of testing, including the fish in Marshwood Lake. Although the state is testing, conferring with independent scientists, and consulting with the EPA, for neighbors of Chemours, these efforts are invisible and do little to ease the anxiety. “Nobody will do anything,” said Jimmy Dew, Elsie’s husband. Democrat State Rep. Billy Richardson, whose district includes Cumberland County, was less sanguine. “I’m a cautious optimist,” said Richardson, an attorney. He has met with Rob Billot, the lawyer who took on DuPont in West Virginia and won — after 18 years. Rep. John Szoka, a Republican from Cumberland County, who sits on the House River Quality Committee, had joined Richardson in unanimously voting for House Bill 189. That legislation not only required further studies by DEQ, but also appropriated $2.3 million to the department to help expedite their work on the GenX and emerging contaminant problem. However, the Senate adjourned without even hearing the bill. However, the Senate had been clued in on the bill well before the vote. Since then, the only public activity by the Senate River Quality Committee members has been to ask the EPA to audit DEQ. 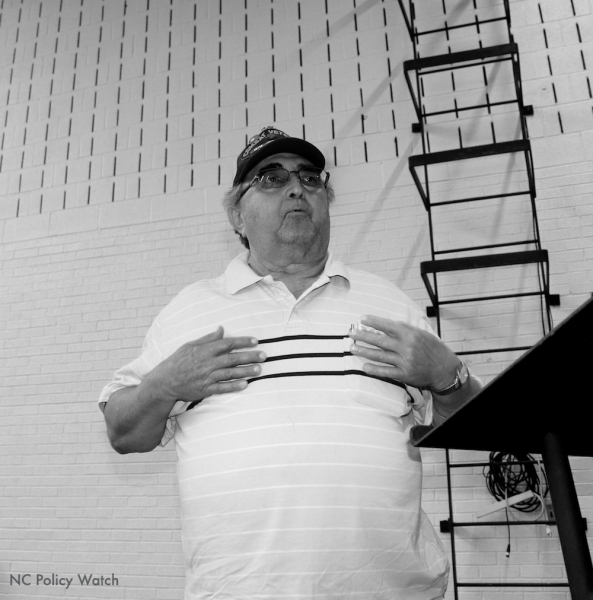 None of the political maneuvering, though, helps the residents. The area near the plant is a mix — some comfortably middle class, others living paycheck to paycheck or on Social Security. 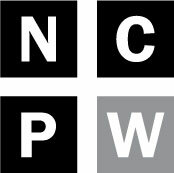 Even if they eventually could connect to a public water system, a $20 monthly bill would cut into their meager income. 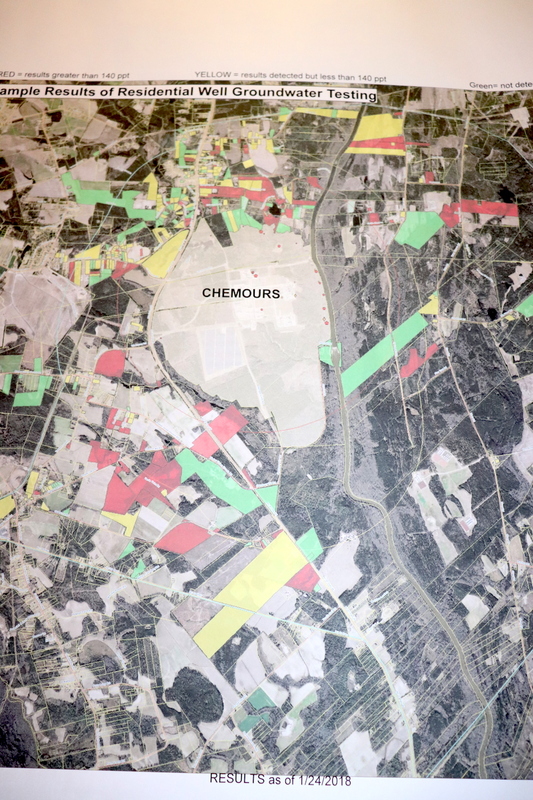 Most of the residents do not trust Chemours not only because of DuPont’s history, but the company’s lack of transparency in what chemicals they’re discharging, their unreported spills, and their insularity. Chemours has not attended a public meeting, including those held at the legislature. The military knew then that the chemical defoliant, Agent Orange was linked to cancers and other serious health problems. And Dow Chemical was among the companies that manufactured Agent Orange; Dow has since merged with DuPont, the mothership of Chemours.